Wooden chess table is one of chess game equipment that has chess squares on its top part. People who want to play chess using chess table should put the chess pieces on its top part. To add the comfortable of playing chess, they should take chairs or stool for seat. Furthermore, this chess table can also use as house furniture. It would become multifunction furniture if you have one. You can use it as chess table in chess game. But if no game, you can put some glass cup of tea on it and having drink some tea with your guest there. 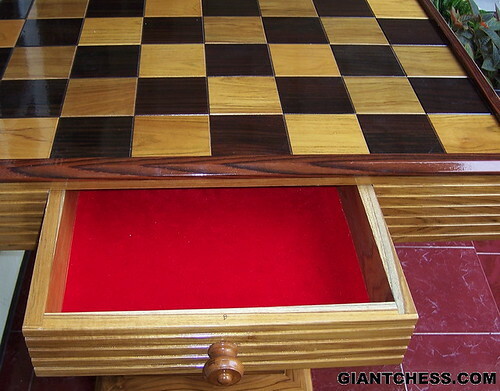 This chess table has equipped with two drawers at its sides. It aimed to save the chess pieces in it, so you do not need any suitcase or box to keep your chess pieces. Made of Teak wood material and carved carefully by expert craftsman. So durable product for indoor and outdoor use. Have it one for your chess equipment.